It is commonplace for most people to be confused when they have to differentiate between microprocessors and microcontrollers. At the very onset they may appear to be the same but they are certainly not. 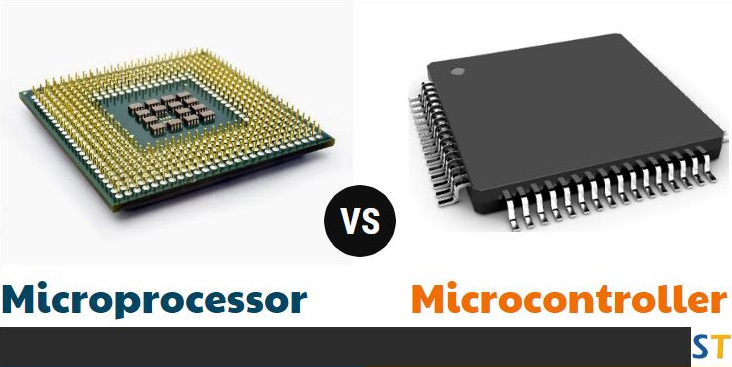 This article aims to throw light on the major differences between a microprocessor and microcontroller in the simplest of ways. Read on for more. It is the heart of a specific embedded system in an electronic device like a washing machine, microwave oven, etc. The Von Neumann architecture/model forms the base of microprocessors. The same memory module is used for storing data and programs. The general processing speed of microprocessors is 1 GHz or above. They work faster than microcontrollers. The tasks performed are generally less complex and limited. A microprocessor is defined as the unit that controls a micro-computer. A microprocessor is often referred to as the central processing unit but is much advanced with respect to its architectural design. It is designed on a silicon microchip. A microprocessor is capable of processing, executing, storing and passing on the results of logical instructions passed in binary language to it. Equipped to perform ALU (Arithmetic Logical Unit) related tasks, it communicates with connected devices and different parts of a computer to control data flow effectively. Ted Hoff, who was associated with Intel as a young scientist, is accredited with the invention of microprocessors. Hoff received a feasible platform for the development of microprocessors when Intel was commissioned by a Japanese company by the name of BUSICOM. Hoff was asked to design a chip in the form of an entire mini-computer for BUSICOM’s new series of calculators. Albeit a complicated one, the chip was successfully designed by Hoff. Frederico Faggin, an engineer with Intel, was responsible for designing the chip into a workable product. The first microprocessor chip was named 4004 and was 1/8" by 1/16". It had 2300 transistors firmly etched into silicon and was equally powerful (if not more!) as ENIAC, which was built in 1946. ENIAC was a whopping 30 tons computer! The Intel 8085 was introduced in 1976 as an 8-bit microprocessor. The microprocessor is software-binary compatible with Intel 8080. It has two additional minor instructions for supporting its serial and interrupt input/output features. In comparison to Intel 8080, Intel 8085 requires reduced support circuitry. It has paved the way for the development of less expensive and simpler microcomputer systems. A microcontroller is defined as a low-cost, small microcomputer. It is a small computer that is designed in a singular integrated circuit. Dedicated to perform specific tasks such receiving remote signals, managing embedded systems, displaying the information on a microwave, etc. a microcontroller can execute a single application only. In general, it consists of the memory (EPROM, RAM, ROM), the processor, input/output peripherals (timers, counters) that are programmable, serial ports, etc. Microcontrollers are mainly used in automatically controlled devices like cellphones, washing machines, cameras, microwave ovens and other electronics. Gary Boone, who was associated with Texas Instruments invented the microcontroller during the period 1970-71. He successfully designed a singular integrated circuit chip that was capable of holding all the essential circuits contained in a calculator with the exception of keyboard and display unit. This revolutionary breakthrough took the world of electronics and communication by storm and was named TMS1802NC. Boone’s invention had 5000 transistors with 128 bits of access and 3000 bits of program memory.